For Prices and more info on any of the horses that are listed please contact us, we'd love to hear from you. Other, more UTD pictures and Copies of AQHA/ FQHR papers of the horses upon request. We are currently working on our site. We apologize. If you have any questions please let us know. Our sale barn will be current shortly. Updated pictures of the 2 year olds, and info on available yearlings are coming! This guyis a beauty. He is so easy going, friendly and looks just like his mama when she was a baby. Compact, stocky and excellent bone. His dam is one of the daughters we kept back of Poco Mave and the mare Poco Ojos Pat. This boy should be able to do it all! from working cattle, heeling, reining... Will mature to be around 14.3hh Is beginning his training and his price will increase as we go. This guy just wants to please, very smart. This is a very pretty girl. She is very light. Almost a cream color. Her mom is our dunalino mare Poco Hollywood Miss and she is sired by RR Dun It Classy. These babies tend to mature to be around 15.1hh and have a very solid build. They are athletic and have very nice bone to them. Their mindsets are very easygoing. They are level headed and have been wonderful to work with. A nice cross of classic reining lines with strong Poco Bueno influence. Siblings are working cattle, being worked in raining and are solid all around horses. This girl has got some size to her. Huge hip and bone. She should be around 15.2hh when mature. She is a dark ( smutty ) dun color, not quite grulla. These babies have really nice movement to them. Just nice solid stocky horses. She should excel in ranch work and roping. Her full sister was super athletic, she can turn on a dime when being worked under saddle. This young mare has the same type of build as her older sister. I'm guessing they will be very similar when she matures. Siblings have won money at halter. Some have also become some extremely handy ranch horses being used for roping and sorting cattle. AQHA must of had a sense of humor the day they named this girl! It doesn't matter to us what her name is tho, because we absolutely love the bloodlines this girl has. Foundation performance lines at their best. Her dam Juanatop That Jaz, is our daughter of Jaz Poco Goldun Blue ( world champion sire ) out of one of our old reining mares Juana Smokem ( NRHA money earner) This little girls sire is Hollywoods Lena Too. She has top reining and cow horse performance horses all over her, top and bottom. She has huge hip and great conformation. Very pretty overall. We're looking forward to bringing her along. If she stays true to her breeding she should definitely be a top contender in the arena and with everything else she does! This guy is very well built. Huge hip, nice shoulder. He is by one of our proven rope mares and by our NRHA stallion Hollywoods Lena Too. This guy is bred and built to work. He is very curious and outgoing. He has the likes of Hollywood at Dawn, Hollywood Bill, Sonitas Last, Wheeling Peppy on his papers. With his sire and dam both proven he has a wonderful foundation to build on. Built to be a top ranch and rope horse. He'll mature to be around 15.2 The mare likes to produce big... He is currently being worked in the round pen. Very soft on the lead, respectful on the ground. Wonderful to work with. Check out the build on this guy! Compact and stocky. Love the hip. He is a rich dark bay. Sired by RR Dun It Classy and his dam is our daughter of Lenas Wright On. His bloodlines have strong foundation breeding with proven reining blood. He has horses that add up a total of well over $250,000 in LTE in reining/ cowhorse events in just the first 2 generations! These horses have excelled in the arena with reining and working cattle. Very quick and athletic. He is willing and very quick. Will be 15-15,1hh when mature. 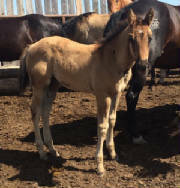 This is a nice looking filly by our stud Hollywoods Lena Too and by one of our proven mares - HCF Flying Miss ( NRHA money earner ) She has a dorsal stripe and some leg barring. We think she is a bay with counter shading. Regardless of her color she is a very nice girl with tons for offer. She is very sweet and fun to work with. Loves people. She has a very correct build and nice lines. With the performance records from her sire and dam this girl could be a top pic for a reining/ cowhorse prospect. She could even make a nice heel horse prospect. What this girl could do could be endless with her mindset. This is a really good looking guy by one of our Poco Bueno mares - Pocos Lost Buckskin and sired by RR Dun It Classy. He is a compact, stocky guy. Nice build and hip, huge bone. Built just like his dam. He is very outgoing and a gentlemen to work so far. His talents should be endless - cow horse, heeling, ranch work. He's definitely bred to be a contender in those disciplines. Will be around 15.1hh when mature. Not many young horses around with this type of breeding.